The Community 1st Oldham sponsored ‘Oldham Sport Active’ project has got off to a flying start this year, with almost 150 young people and families taking part so far. 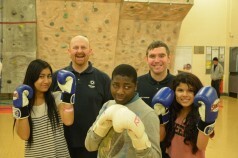 The initiative, run by Oldham Community Leisure and made possible with funding from Sport England’s Community Activation Fund and an additional contribution from Community 1st, aims to inspire people from deprived areas to get involved in sport. A host of sporting activities are on offer in leisure centres, youth zones, parks and community centres across Oldham, and sessions so far have included climbing, rounders, badminton, thai boxing, exercise to music, running and swimming lessons. Community 1st Oldham is proud to support Oldham Community Leisure in this project and we are delighted with its continuing success.